RIDE YOUR MIND (RYM) is the PhD Project of GEElab student Jens M Stober. It is an artistic, hackish, neurofeedback, real-time virtual reality game or, in brief, a NeuroVR Game that forces the user’s conscious to compete with his subconscious. The Concept of RYM is based on a playful strategy for designing artistic games that is extracted from the history of hacking. Early hacks consisted of artistic and gameful content like algorithmic visualisations and interactive programs: that is, games. The aim of RYM is to imbue the player with an awareness of his own brain as a consciously controllable tool comparable, for example, to his hand. It achieves this aim by forcing the player’s conscious acting into competition with his subconscious acting; the player receives direct neuronal feedback showing him his unconscious brain activity, eliciting a whole new sensation of self. 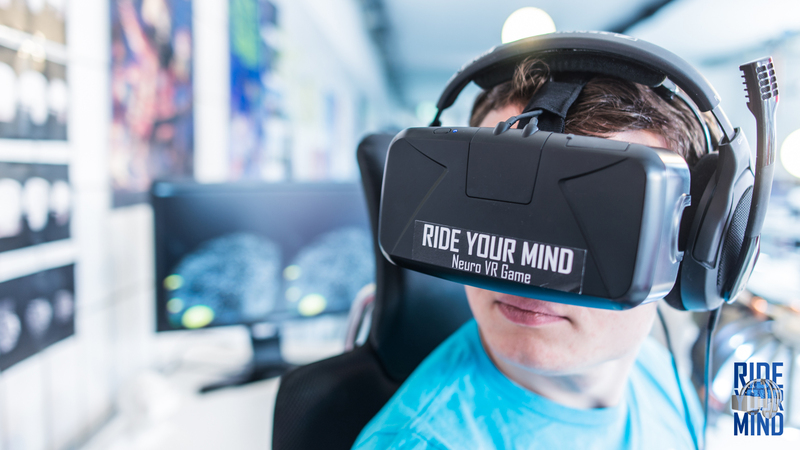 At the same time, the virtual reality environment as a void, allows the player to interact by moving his head, which, in turn, triggers further brain activity. The RYM concept does not ignore the fact that the game experience is a highly intimate one in which personal sensory data is temporarily stored and processed. If the user does allow the data collected to be stored or even anonymously shared, it can be interpreted by medical experts and thereby serve as a contribution to cognitive neurological research. Running a game generated by neurological data in real time requires knowledge gleaned from medical research. In other words, the game itself entails a recontextualisation of medical knowledge into a gaming and art context. RYM uses knowledge and devices from the medical world to create an artistic and experimental form of entertainment. The NeuroVR Game RYM is generated by neurofeedback collected by an EmotivEEG Brain Computer Interface (BCI). The game environment gets responsively designed by the actual neuronal data. An Oculus Rift Head-Mounted Display (HMD) displayes the playable visualisation of the users brain. The data will be processed using Unity3D and a specially developed Neurogame Design Toolchain for Unity3D by diploma candidate Iris Birnbaum from KIT / TECO.